This comparative descriptive mixed methods pilot study reports results of a joint research pilot study between the University of North Texas (UNT) and the Autonomous University of the State of Mexico (UAEM). Data was collected and analyzed for effectiveness, usability, and knowledge acquisition in the Leopoldo Flores Museum located in Mexico, and its online 3dimensional replica. The primary results of this research show a) students using the virtual environment first and then visiting the museum exhibited better knowledge acquisition about the museum and had higher level of discourse when on the guided tour, and b) the virtual museum experience, when used alone, was a comparable experience to the actual museum guided tour in both knowledge gained and satisfaction. In the decade of the 1950s, Morton Heilig invented the Sensorama, a simulator designed to provide the illusion of reality (Rheingold, 1991). Since then, several other tools such as multi-user virtual environments (MUVEs) have been developed and used in the corporate, entertainment, and educational arena to simulate real world experiences. MUVEs, sometimes also called virtual worlds, provide users with perceptual stimuli in a simulated ecosystem, where digital representations of oneself interact with others in a dynamic community (Bell, 2008). 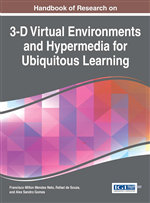 Three-Dimensional Virtual Environments: Designed information spaces that provide users with perceptual stimuli in a simulated ecosystem. Avatar: A virtual representation of oneself used to interact with others in online environments. Informal Learning: It arises from the personal interests and intrinsic motivations of an individual to acquire knowledge. Synchronous Communication: Visual and verbal interaction between two or more individuals, happening at the same time. Engagement: In educational settings, it refers to the degree of participation and involvement an individual shows when he is being taught. Rendering: It is the process of generating an image through a computer program. Motivation: It is the desire to do things. It can be extrinsic, which is tied to usefulness and personal gain, or intrinsic, which is tied to enjoyment. Virtual Museums: Simulated representations that offer the same content encountered in a real museum visitation, and are usually – but not exclusively- delivered through the World Wide Web.